DPS is a photography school based in Dublin specializing in Beginners DSLR Courses, But catering for all Levels From Studio to Photoshop and everything In between. Dublin Photography School is delighted to announce the third edition of Snapshot photography magazine, will be released on Tuesday the 16th of December 2014. As well as the usual features like hidden gems, pencil it in, and much much more. 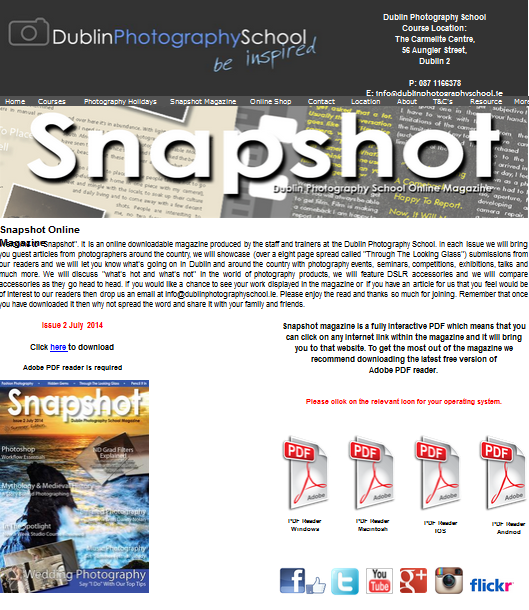 Snapshot is a free download from Dublin Photography School and we are always looking for submissions from photographers and bloggers, so if you feel you have an article in you, please do get in contact with us. Dublin Photography School offer beginner’s photography courses in Dublin as well as courses aimed at improvers and advanced students. From beginners DSLR to Studio and Photoshop we teach it all, with over 5000 Students in Four years, Dublin Photography school is one of Irelands premier photographic trainers.